Ooh. I can hardly bare to look at it. 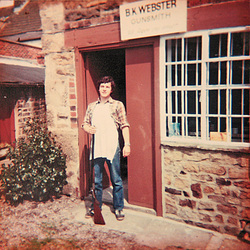 Me, outside my first in workshop in Masham, Yorkshire, on the day I opened for business as B K Webster Gunsmith in 1984. I can just make out the leaflets for Ox mainsprings and Sabot pellets in the window. I believe that at that time I was the youngest independent registered firearms dealer in the country. I'm not so young now though. I am holding an old 12 bore hammer shotgun that I used to shoot rabits on the farm. I was lucky to find a Yorkshire based gunsmith within easy commuting distance who was looking for an apprentice. I started working part-time, and took up a full time apprenticeship with him when I left school. I was fortunate that I was trained in a wide range of general repair techniques, which to my young mind seemed to involve an inordinate amount of hand filing. This stood me in good stead though, as the ability to hand file parts, especially for older shotguns, is a skill that I still use today.